Jeremy Cox, jcox6@delmarvanow.comPublished 6:00 a.m. ET Nov. 15, 2017 The red, barn-like building in Princess Anne's industrial park was custom-built for a company that — until it closed a few years ago — transformed spent cooking oil into biodiesel fuel. Its new tenant has something with a little less zing in mind. But not much less. Tom and Tina Cropper have turned the 6,000-square-foot plant into a distillery, the first in Somerset County in modern times and the second overall on the Lower Shore of Maryland. The first opened in June 2016 at the Seacrets resort in Ocean City. The couple hopes to open Spirits of the Patriots soon. They received the final government approval they needed to start making alcohol this week, and it will take at least two or three weeks before the first batch is ready for sale, they say. For the time being, they plan to produce two general types of spirits: rum and rum-based moonshine. Another part of their business blueprint: tastings and tours. Tom Cropper said he envisions the distillery becoming a tourist destination for downtown Princess Anne, which lies just over a quarter of a mile to the north. "Bringing tourists into the town to have a tour and a taste, learn a little bit about how distilleries work and some of our unique flavors we've having here in the distillery here is something very important to us," he said. "Being able to demonstrate an artisan skill, a craft skill, in the local area, I think, is very important." Like many rural towns nestled among Delmarva's marshes and farm fields, Princess Anne struggled for years to find an identity. But in recent years, several building owners have used government grants to spiff up their facades. Antique stores have taken over empty storefronts. And last year's opening of the refurbished Washington Inn and Tavern has provided the corridor with a center of economic gravity. The distillery should add to that momentum, said Carrie Samis, the Main Street program manager. The building's previous use may have had the opposite effect. The Progress Lane facility was constructed a decade ago for Greenlight Biofuels. Excitement over the prospect of locally produced energy quickly dimmed after a 2008 explosion at the plant claimed the life of a worker and shook homes in the nearby Hampden Avenue community. The company never fully recovered from the blast and closed within a few years. Greenlight auctioned off the property for $190,000 in August to a Denton-based real estate investment firm. Cropper said he heard about the potential site just after the auction and contacted its new owner, Northern Chesapeake Investments LLC, about leasing it. "It's just perfect for a distillery," he said. There's plenty of room to grow. 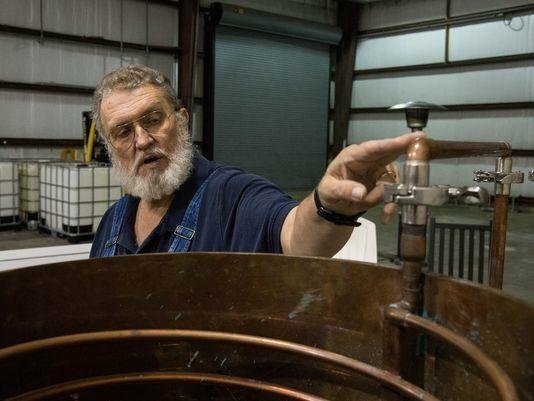 His 100-gallon pot still occupies less than a quarter of the floor space. So, as the business grows, he can add more stills. Cropper's story doesn't follow a straight line to alcohol. Tom's father founded Cropper Oil & Gas in Berlin in 1968. Tom's sister, Ginger Warren, continues to run the business while his brother, Craig "Big Bird" Cropper, is a well-known fisherman. For his part, Tom flew helicopters in the Army just after the Vietnam War. In the 1980s, he poured himself into writing software code and made his wealth developing proprietary programs for entities ranging from commercial airlines to the Department of Defense. After he sold his list software design firm, he came to a realization. "Sometimes, it's disheartening to know that 98 percent of what you've developed is outdated," he said. Approaching his sixth decade of life, he decided to learn the trade of high-end distilling. He read widely and went as far as becoming an intern for a distillery in South Florida for six months. "If I want to do something fast and make a lot of money, I'd be in the software business," Cropper said. "Now, we're looking for something a little slower and hopefully a little better." That sentiment is embodied in the official name of his his company, OTVB LLC aka Only the Very Best. He hopes to branch out into vodka, gin and whiskey as he learns his craft and widens his customer base. Although his initial offerings revolve around rum, he plans to offer a wide array of options. Delmarva Dew, for example, will be his white moonshine, the kind that isn't aged. Another known as Tidewater Tea will be aged slightly and, therefore, brown. For those who like to blend some politics with their beverage of choice, he plans to roll out Deplorables Rum. Yes, the reference is to Hillary Clinton's characterization of Donald Trump supporters. And, yes, the label incorporates the now-president's campaign sign iconography — retaining the "RUM" but blacking out the "T" and "P" in his surname. "I think about 40-49 percent of voters would be interested in a Deplorables Rum," he said. "Find out what people want. Get it for them. We'll see." Trump's approval rating is hovering around 37 percent, according to the poll tracker FiveThirtyEight. Cropper is looking to sell his spirits wholesale to dispensaries in Maryland at first and then expand to Delaware and Virginia. Customers will be able to buy as many as three 750-milliliter bottles directly from him, under state law. As of 2007, Maryland hadn't licensed a distillery since 1972. Today, with the addition of Spirits of the Patriots, the industry boasts 20 facilities across the Free State.